Barack Obama on Wednesday said Hillary Clinton made him a better president but did not take credit for it as the outgoing US president made a strong pitch for the Democratic nominee for having taken some tough decisions and working “tirelessly” as his former secretary of state. 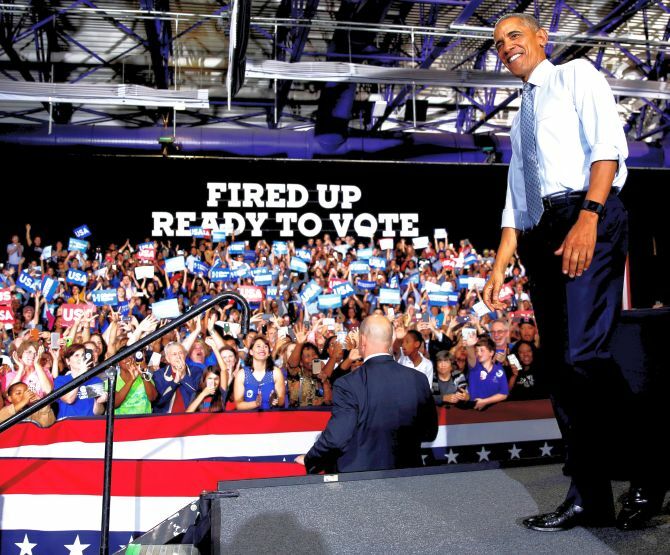 “Her efforts are not always flashy and they’re not always appreciated here at home, but she made me a better president, and she didn’t ask for credit,” Obama said as he hit the ground for a campaign blitz in key battle ground states ahead of the November 8 general elections. Clinton will be a commander-in-chief who would defeat the Islamic State, he said, adding she will make a “smart and steady” US president, though not without her share of mistakes. “I saw her as my Secretary of State. I saw her in the Situation Room, making the argument to go after (Al Qaeda chief Osama) bin Laden even though it was risky. Tirelessly circling the globe as secretary of state. Respected around the world,” he told his supporters at an election rally -- his first in the last week of the presidential campaigning -- in the key battleground state of Ohio. Obama said when Clinton was challenged, she does not “make things up on the spot”. “She doesn’t double down on lies -- that obviously are lies because there’s video,” he said in Columbus in an apparent reference to some videos of Republican presidential nominee Donald Trump that have resurfaced. “She actually understands the world. She understands the challenges we face. And when things don’t go her way, she doesn’t whine or complain or blame others, or say everything is rigged,” he said amidst laughter. Obama contrasted Trump’s complaints of “rigged polls” to the 69-year-old former secretary of state, who takes criticism in her stride and works towards bouncing back better. “She doesn’t say the polls are great when the polls are in her favour, and then when they don’t go in her favour, the polls stink and nobody knows what they’re talking about. She just works harder and she comes back better,” he said, adding that she has concrete plans to do what she promises. “She’s thought it through. And she values hard work, and she respects working Americans. And she’ll be a commander-in-chief who finishes the job of defeating Islamic State. And she will be a smart and steady president of the United States,” he said, using another acronym for the dreaded ISIS. “Has she made mistakes? Of course. So have I. There’s nobody in the public arena over the course of 30 years that doesn’t make some. But she is a fundamentally good and decent person who knows what she’s doing and will be an outstanding president,” Obama said amidst applause from the audience. He added: “There’s a reason why we haven’t had a woman president before. And I think that sometimes we’re kind of trying to get over the hump. We have to ask ourselves, as men -- because I hope my daughters are going to be able to achieve anything they want to achieve and I know that my wife is not just my equal but my superior. Obama said Clinton knows that the decisions that a president makes matter so closely to someone out there. “It means whether a veteran is getting the right care or not. It means whether a soldier is going to be put in harm’s way or not. Knows what it means to parents trying to make ends meet; or whether that plant stays open; or a student who’s trying to go to a college for the first time; or a young person who’s brought to this country as a baby and now just wants to contribute to the only home she’s ever known. Hillary knows they need a champion,” he said.